Bert-Jan Lindeman (LottoNL-Jumbo) took victory from the breakaway on the first mountain stage proper of the 2015 Vuelta a España, as Chris Froome’s (Team Sky) overall hopes were dealt a blow after he failed to stay with his GC rivals on the category one summit finish. Dutchman Lindeman took the biggest victory of his career after riding in a five-man break, also including Carlos Quintero (Colombia), Amets Txurruka (Caja Rural), Jérôme Cousin (Europcar) and Ilia Koshevoy (Lampre-Merida) from the 12km mark. The group established a maximum gap of over 13 minutes at one point, but more importantly, they reached the foot of the 19km finishing climb of Alto de Capileira with around six minutes of the peloton. Cohesion then fell away from five riders as they began to attack each other, with Frenchman Cousin making the first move. It was short lived though, and as the likes of Quintero fell away, Koshevoy made the biggest move, reaching out on his own for a number of kilometres before Cousin and Lindeman rode back to him. As the three approached the steep 14% ramps of climb’s finale, Cousin appeared to take fall and was dropped his two breakaway rivals. Koshevoy lead Lindeman up the climb, but was unable to match the speed of the LottoNL man as he made on last dig to take victory on the biggest stage yet of the Vuelta. Behind them, the GC battle raged into action in earnest at this tour, with Fabio Aru making the biggest move within the final kilometre to grab a handful of seconds from his fellow GC contenders. 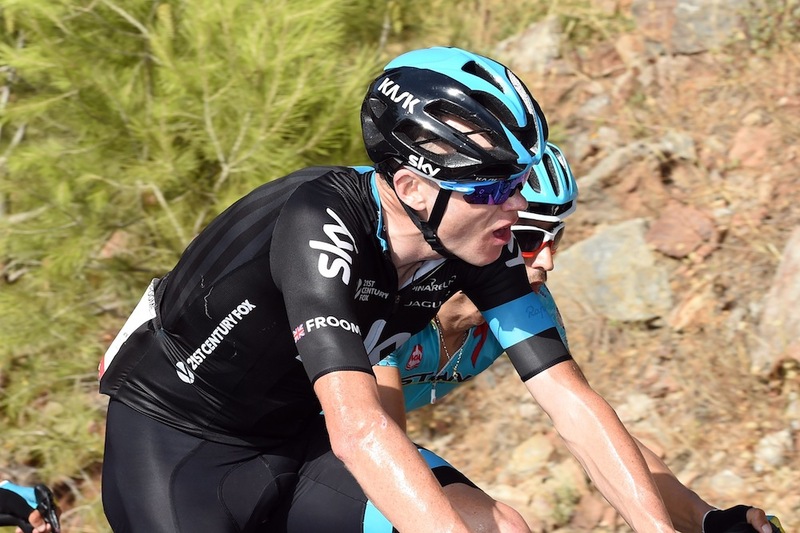 Britain’s Froome was the biggest casualty however, as the 2015 Tour de France winner failed to show the kind of climbing prowess which won him the yellow jersey back in July. Froome finished 34 seconds back on Aru, but also lost 27 seconds to the likes of Alejandro Valverde (Movistar), Nairo Quintana (Movistar. Joaquim Rodriguez (Katusha) and Rafal Majka (Tinkoff-Saxo, dropping out of the top-10 into 12th place overall. Colombian Esteban Chaves (Orica-GreenEdge) held on to his 10 second advantage in the red jersey over Tom Dumloulin (Giant-Alpecin), after both impressively stuck-it out with major players on the long and arduous climb to the finish. The Vuelta’s parcours look a little bit kinder for the riders as they head into stage eight, with a largely downhill start on the 182.5km course from Puebla de Don Fadrique to Murcia. There’s two category three climbs to overcome before the finish, but it could be another day for the breakway after Lindeman’s success on Friday’s mammoth test.